Above interesting image and a good write up on adaptability available here. While imparting training one often wonders, what is the core output that one is trying to provide to the organization, as a trainer? Is the concept of training, all about the ability of the raw MR trainee to understand what a visual aid is, and how to do visual aid detailing with pointer, or is it making him understand the importance of retail prescription monitoring? Or is it inspiring him with the interesting complexities of pharmacodynamics and pharmacokinetics of a drug?! Or is it impressing him on the approach to marketing, the way the brand is delivered to prospects and customers, ie., internal marketing?! The answer is yes to all the above questions, yet training is much more than above elements. Verily, training's core output is IMPROVING ADAPTABILITY OF AN ORGANIZATION!! Adaptability is changing oneself or changing a process to fit in to the changes that are occurring (in the environment, internal and external)! In essence, organizations and personnel who are adaptable, are ones who finally grow and survive. Training is an approach that provides organizations and personnel, the knowledge and tools for adaptability! 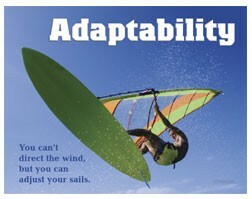 The need for adaptability is at all levels. The top management, members of middle and lower tiers of management - all require adaptability. The concept of adaptability implies learning and applying new knowledge and tools for growth. Hence, adaptability, training and learning are intertwined processes. When new MRs or field managers grace training programs, they have definite expectations of empowerment. They are on the look out for product knowledge, field approach tips, and tools that will help them adapt and take on challenges in the market. This adaptability should help the field personnel in 'prospect conversion to customers', and facilitate customer retention. Only when training programs provide skills, knowledge and tools for adaptability, only then will they be perceived as vital and relevant. Training is a very delicate discipline. Trainees may find training experiences useful or useless. This depends on how relevant training programs are. Mere training on product knowledge will not be satisfying. After all, there is 'good to know knowledge' and 'good to use knowledge'. It is the latter type of knowledge that will improve adaptability of the trainees. So it is essential to give practice to trainees so they may equip themselves with talking points of products, only then will they be empowered and adaptable. e) the training programs provide HOPE. The content, style and presentation should inspire and give hope to trainees that the inputs are truly relevant for enhancing personal effectiveness. How to bring in adaptability points in to training programs? The best way that brings in adaptability in to training programs, is MBWA! This stands for Management By Walking About. It refers to the need of trainers to be constantly interactive with present and future trainees, participative in the current processes, and at the same time have a keen mind to learn about market dynamics and environmental fluxes so that the trainer will know the needs of potential trainees in advance, and through his knowledge of market or processes or the environment, the trainer can design training programs that will enhance ADAPTABILITY of trainees (whether they are field personnel or office employees). Training is thus, in its final analysis all about enhancing the learner's adaptability. Only then will training contribute to organizational survival and growth. PS: Just concluded a good training program at Lucknow! Thanks for reading this blogpost, please scroll down and read all other blogposts (click on older posts as and when required), please recommend this blog to acquaintances.